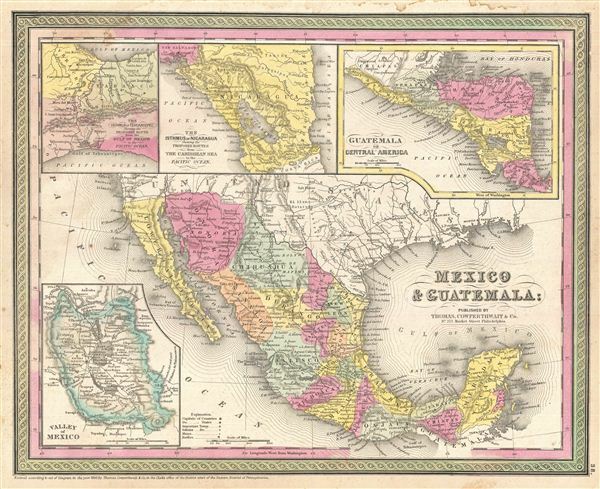 A fine example of Thomas Cowperthwait and S. A. Mitchell's 1854 map of Mexico and Guatemala. The whole is engraved and colored in Mitchell's distinctive style with green border work and vivid pastels. Political and topographical features are noted and color coded with elevation rendered by hachure. This map features several insets. The upper right insets, focusing on the Isthmus of Tehuantepec and the Isthmus of Nicaragua, are intended to illustrate extant and proposed routes from the Caribbean to the Pacific Ocean. In the upper right another inset focuses on the general Vicinity of Guatemala, Nicaragua, Honduras, Costa Rica, and El Salvador. A further inset, in the lower left quadrant, focuses on the Valley of Mexico and Mexico City. Very good condition. Blank on verso. Light dampstaining to the upper margins. Rumsey 0537.037 (1846 edition). Phillips (Atlases) 814.